Look at this cute little candy dish. 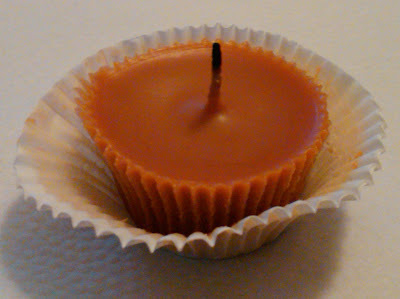 Would you ever think that it was once home to a delicious smelling pumpkin pie candle? 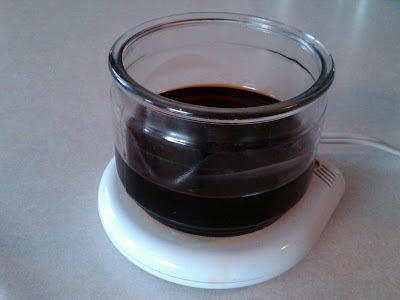 Do you have a candle on your candle warmer that's just about all used up? Or some candles you burned a while ago and have piled up in a cupboard somewhere thinking you might do something with them some day???? 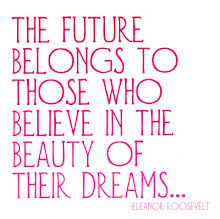 You might just throw away the candle when it's all gone. 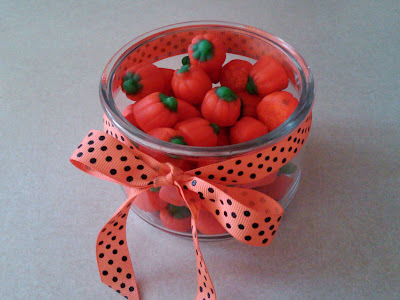 Make a candy dish or some cute little mini candles. 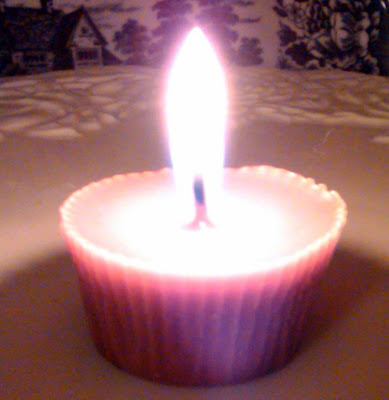 Then you have an adorable mini candle. You can burn it and still enjoy the candle scent, or trim off the black end of the wick and you have a brand new mini candle you can give as a gift. 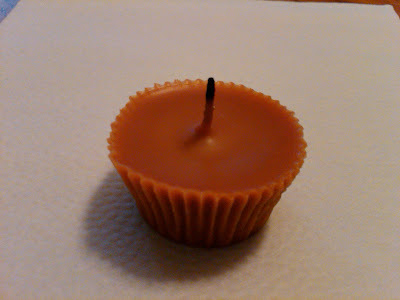 Jeff is 9 and made this candle with a bit of supervision and wrapped it up and is giving it to his school teacher for a little Thanksgiving gift. If you just want to make the candy dish, melt the wax and pour into an old plastic container and throw it away in the trash. 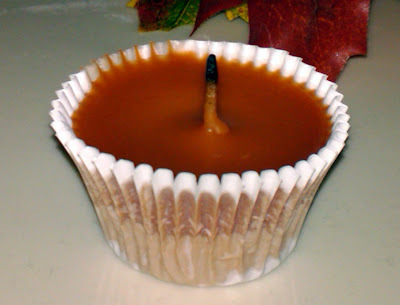 Then wipe the rest of the melted wax out with a napkin or paper towel. Warning: Never, I mean NEVER pour hot wax down the drain or you will be calling your plummer!!! Also ,Warning: If you don't have a candle warmer, but you want to melt the wax, NEVER melt it in the microwave if it has a wick in it, because it has metal and you could have a serious disaster if you put metal in the microwave!!! Instead, put it on a pan on the stove on medium heat (watching carefully) until the candle is all melted and then continue on with your project. The other night I was thinking of all the things this adorable glass dish could hold, like: Veggie dip, Salsa, Buttons, Beads, Sea Shells, and, Oh, my...My mind just decided it's late and time for sleep and I can't remember all the great uses I thought of the other night. Well, You get the idea. It was really fun and easy to do. 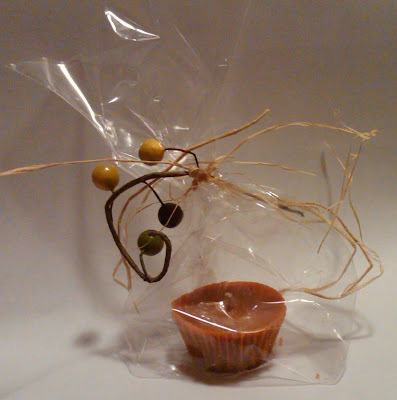 I liked this project and will do more, Because MY cupboard is full of used up candles!!! 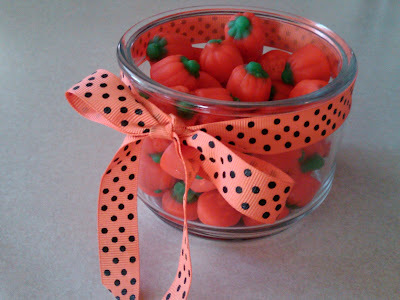 Now Im going to go eat one (or three, or four) of those candy corn pumpkins and go to sleep.